It is a matter of great pleasure when you get selected for a scholarship program. 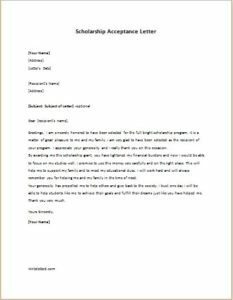 The following is a letter written in order to show your gratitude towards the Institute for offering you the opportunity to excel better in your studies through scholarship. The letter starts with a thank you note and is followed by an acknowledgment of the scholarship program. The following letter can be used for such purposes. Greetings, I am sincerely honored to have been selected for the full bright scholarship program. It is a matter of great pleasure to me and my family. I am very glad to have been selected as the recipient of your program. I appreciate your generosity and I really thank you on this occasion. By awarding me this scholarship grant, you have lightened my financial burdens and now I would be able to focus on my studies well. I promise to use this money very carefully and in the right place. This will help me to support my family and to meet my educational dues. I will work hard and will always remember you for helping me and my family in the time of need. Your generosity has propelled me to help others and give back to the society. I trust one day I will be able to help students like me to achieve their goals and fulfill their dreams just like you have helped me.